South African wines are some of the best in the world and on my recent trip to South Africa I made sure to try more than a few. 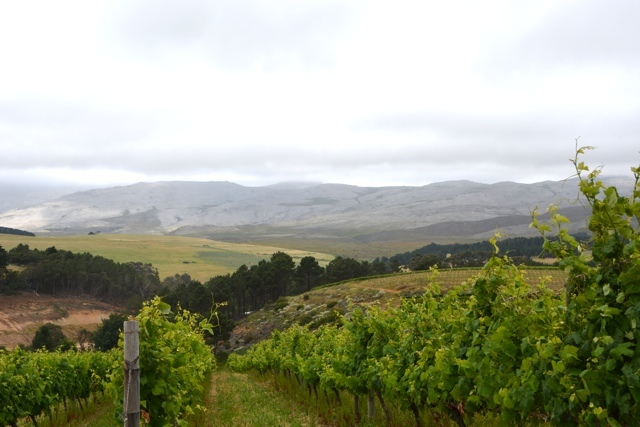 Taking a scenic drive, two and a half hours from Cape Town to my next hotel the Grootbos Private Nature Reserve, I took a detour to Creation Wines at Hemel-en-Aarde Ridge in the Walker Bay area. The fog begins to lift exposing the vineyard, surrounding land and terroir. The minute I got there, saw the gorgeous property in the fog, and read the menu and wine list I wished that I wasn’t driving my rental car. Or that I at least had someone else to drive me so I could of indulged in the wines a bit more than just tasting them. Not knowing where to start my server suggested I try the wine pairing canapés to get a taste for the wine and foods and then choose an entrée from there. 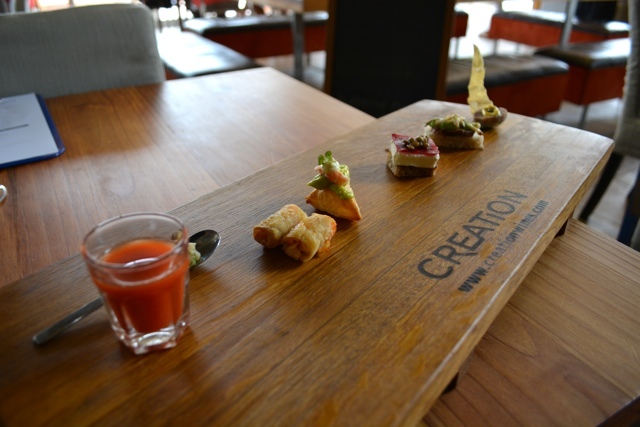 A tasty canapés tasting board. I was served the canapés on a board, and as I completed tasting each wine and it’s paired canapés they would bring out the next wine in a constant rotation. This was nice as not only was the wine served at the right temperatures but it also gave me a break in between tastes and allowed me to drink some water as well. First up was a pineapple and basil gazpacho served with scallops (a small taste of scallops are on that spoon behind the gazpacho) which was paired with a Sauvignon Blanc. Next were sweet corn, ginger and apricot spring rolls served with a taste of Viognier (a white wine not often found in South Africa). The next canapés might of been my favourite, at the very least it was one of the prettiest. 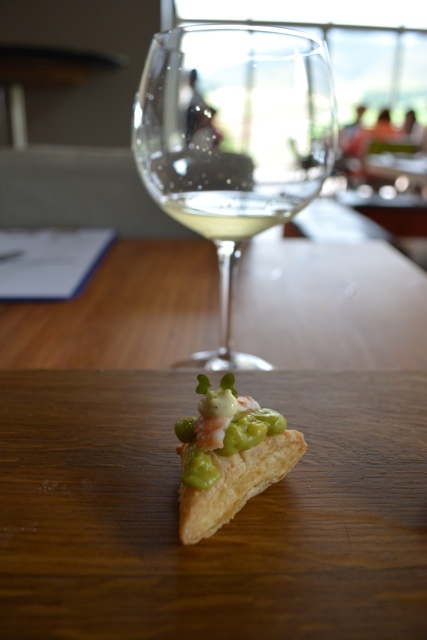 Avocado, prawn and citrus phyllo pastry, with vanilla mayonnaise paired with a Chardonnay. The cauliflower and gorgonzola soup with sour dough herbed croûtes and a taste of merlot. After this there were five more tasty delights: Beetroot, goat’s-milk cheese panna cotta and lentil salsa with a Pinot Noir. Cauliflower and gorgonzola soup with sour dough herbed croûtes and a Merlot. Rare roast springbok, spring greens and valley mushrooms with a Merlot, Cabernet Sauvignon, and Petit Verdot blend. Asian five spice pulled pork wonton with prune and Darjeeling pureé served with a Syrah. Lastly there was the Buchu scented duck confit with Malay aioli served with a Syrah and Grenache blend. 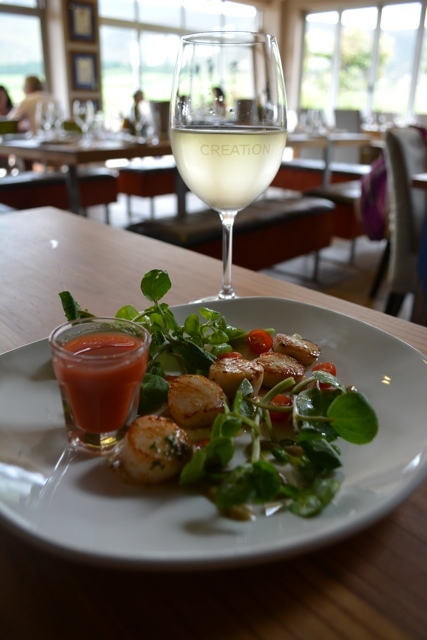 After all of these delightful tastes and drinking a jug of water I was surprisingly still a bit hungry and was intrigued by the gazpacho and scallops so I ordered them as my main. I had imagined a bowl of gazpacho with a couple scallops but instead was served another shot of gazpacho and many tasty fresh scallops. Who can complain? Although I totally could of had 30 more shots of that gazpacho it was so great. To finish it all off as if that wasn’t enough I was talked into the creme brulee. 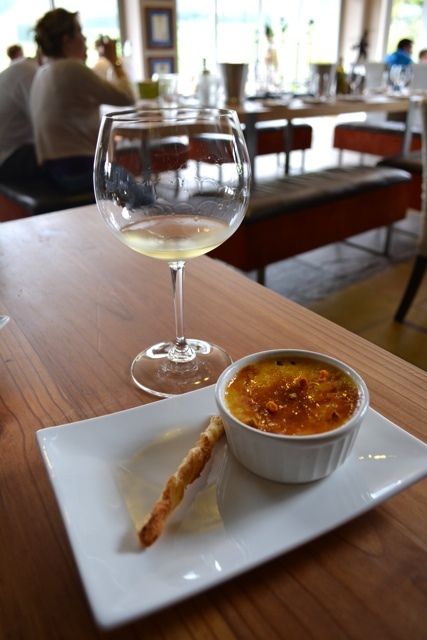 Honey and Rosemary Scented Crème Brûlée and a splash of chardonnay. Sorry I don’t have more photos, but it ended up being one of those experiences where you are so excited to eat that you forget to take a picture until its too late. That isn’t such a bad thing though is it? 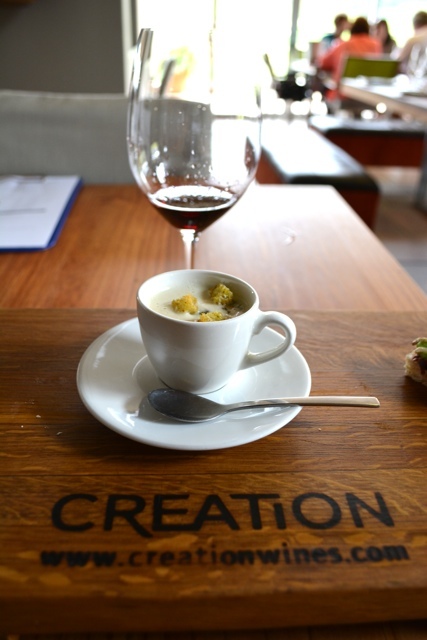 If you are staying in Cape Town, visit Creation Wines and make a day trip out of it or stay somewhere nearby. Try to make a reservation in advance and ask for a seat by the windows overlooking the vineyard. They are kid friendly with a play room and a small kids menu. Also if you have the time be sure to arrange a walk through the vineyard as well. You won’t regret it. 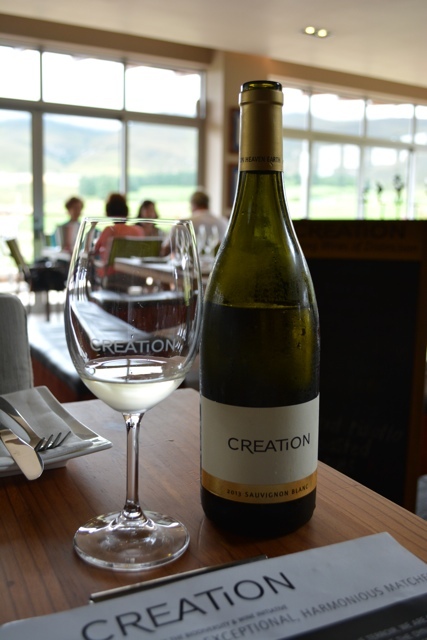 Special thanks to Creation Wines for having me. As always all opinions and views expressed are my own. This made my mouth water. It all sounded delicious! Everywhere I go in the world I love tasting the local wines. This has led me to taste a lot of duds in my time but also a bunch of really great wines that I now call my favourites. 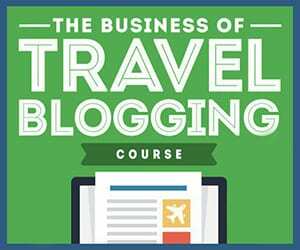 I’ll be sure to add wine tasting to my list of things to do in SA. I loved wine tasting in South Africa. This looks amazing! Honey and Rosemary Scented Crème Brûlée and a splash of chardonnay!! I’d like some of that now please!